Now the company whose name has become a verb is turning passive viewing into a shared experience. 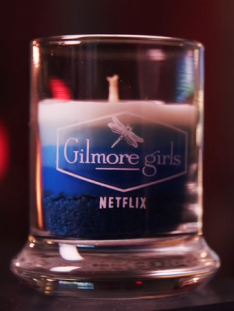 Fans who Netflix the return of their favorite mother-daughter duo in"Gilmore Girls: A Year in the Life" can get the full experience of all four 90-minute installments, each set in a different season, while the scents of winter, spring, summer, and fall waft through the air, courtesy of a limited edition Binge Candle that burns along as you watch the action onscreen. Netflix succeeds in understanding the passion of its members, and supports it with a wink. We’re not crying, we swear – we’re just sniffing the scents from the candle.